Both platforms are extant and were cleared of undergrowth in late 2010. The track has been re-laid through the station close to the 'up' platform. 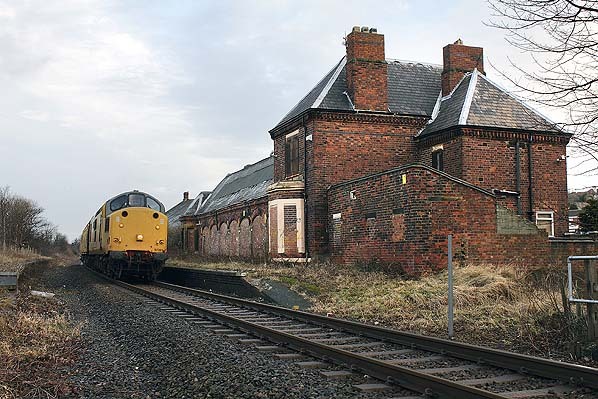 The 'up' platform building has been demolished but the substantial range of 'down' platform buildings are extant and used as a workshop for tyre and exhaust fitting. The adjacent stationmaster's house is still used as a residence. The brick goods shed to the north of the station is also extant as are the degraded remains of the coal drops. Notes: Brotton opened to freight traffic on 23rd February 1865 and to passengers on 1st April 1875. 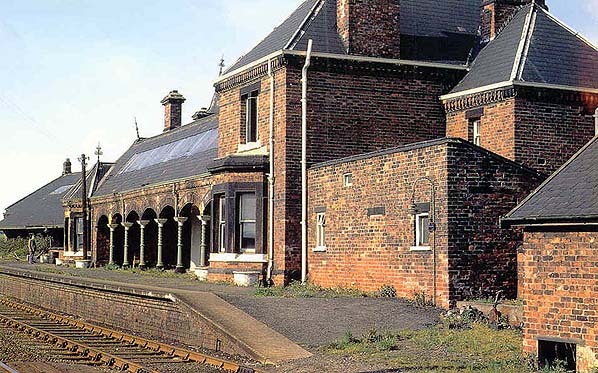 It was provided with two platforms with a substantial range of brick buildings on the 'down' (Saltburn) platform similar to other stations on the line. The range incorporated the stationmaster's house at the south end. There was a smaller brick built waiting room and toilet on the 'down' platform. The goods yard was to the north of the station on the down side and included four sidings serving coal drops and a substantial brick goods shed. 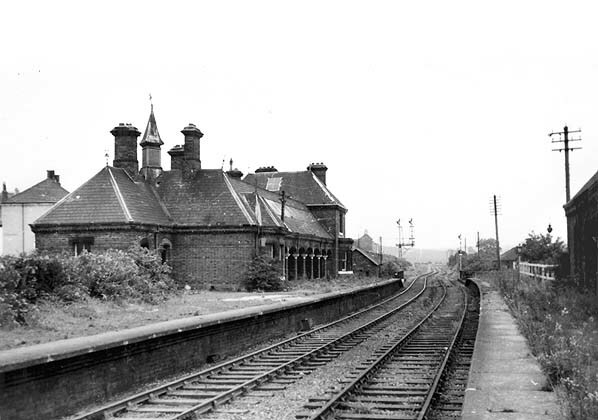 After closure to passengers on 30th April 1960 Brotton remained open for goods traffic but was downgraded to a coal depot only on 3rd April 1967. The coal depot closed some time in the 1970's. Trains from Teesside to Whitby started operation on 3rd December, 1883 with a northern terminus at Saltburn. Trains for Whitby Town reversed at Saltburn West Junction to allow them to take the extension line from Saltburn to Brotton and thence follow the coastal line to Whitby through Loftus which up to then had been a terminus. On 16th July 1885 the line from Whitby to Scarborough was opened so allowing some trains to run through to Scarborough. These trains called at Whitby West Cliff which was connected to Whitby Town by a shuttle service. station which was at the end of a spur. Occasional summer trains would make Brotton via Redcar and the Saltburn extension. Closure of the railway started pre Beeching with the Brotton to Saltburn section closing to passengers on 6th September 1957, Whitby West Cliff to Loftus closing to all traffic on 3rd May 1958, Loftus to Boosbeck closing to passengers on 30th April 1960 and the section from Boosbeck to Guisborough closing to all traffic on the same day. The line from Boosbeck to Brotton was closed completely on 12th September 1964. The line remained open for goods from Saltburn West Junction through to Skinningrove and following the opening of a potash mine at Boulby the line was reinstated for the carriage of minerals between Skinningrove and Brotton from 1st April 1974. In 1862 the Cleveland Railway were pressing eastwards from Guisborough with the construction of their mineral railway and had reached Boosbeck which was quickly opened to traffic. By 1865 the Cleveland Railway had extended their line from Boosbeck to Brotton with goods traffic using it from 23rd February of that year.and by April goods traffic was working to Skinningrove. On 30th June 1865 the railway was absorbed into the North Eastern Railway. The 1865 Act authorised the North Eastern Railway to build a railway from Saltburn to Brotton in order to allow ironstone from the mines in the Brotton and Loftus areas to travel directly to the various works on the Tees east of Middlesbrough. The new line included the impressive Upleatham viaduct, designed by T.E. Harrison, with eleven arches, 783 feet in length and 150 feet high situated on the southern outskirts of Saltburn. Also authorised in this Act was the Priestcroft Curve which branched from the new Saltburn – Brotton line near North Skelton to connect with the Brotton to Guisborough route of the old Cleveland Railway. Also authorised in this act was the completion of the railway as far as Loftus so connecting the town with Saltburn, Guisborough and Middlesbrough. This necessitated the construction of a large curving viaduct over the Kilton Valley consisting of iron girders supported by twelve stone piers carrying the railway at a maximum height of 150 ft above Kilton Beck. In 1911 mining activity resulted in the undermining of the viaduct foundations and it was necessary for the line to be closed here for two years whilst the viaduct was buried in spoil from local mines. An embankment was formed and the line was reopened in 1913. Passengers were conveyed to and from Loftus and Skinningrove by road and mineral trains from the Loftus area reached Teesside via Whitby, Grosmont and Battersby. ending in another reversing neck from which trains could proceed along the valley floor to the various sidings. On 1st July 1872 the line from Saltburn to Brotton was opened to goods traffic and on 1st April 1875 a passenger service was introduced between Saltburn and Loftus calling at Brotton and Skinningrove. By 1878 the Priestcroft curve was opened joining Boosbeck to North Skelton (no passenger station here yet) so allowing traffic from the Guisborough direction to run directly to Saltburn. Passenger trains between Guisborough and Saltburn started on 1st November 1878 and ran via Boosbeck station which was opened on the same day. Many of these trains ran to Saltburn via Brotton necessitating three reversals; at Hutton Junction, Guisborough, at Brotton and at Saltburn West Junction. Some services reached Saltburn directly by the Priestcroft curve although regular passenger workings using the curve had ceased by 1918. 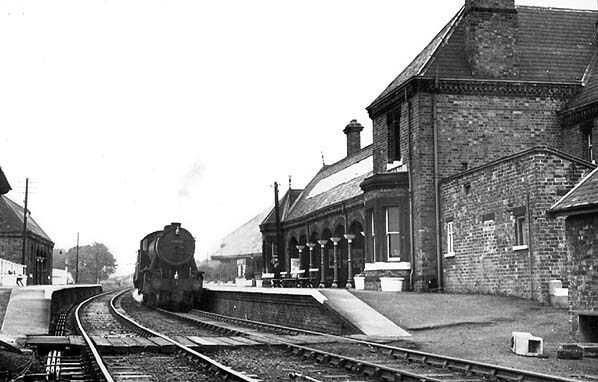 The Guisborough – Brotton – Saltburn – Loftus services were obvious candidates for NER push-pull operation; LNER Steam Railcars and later the BR DMUs were used to advantage here. On 1st July 1902 North Skelton station was opened and remained in use until 1951. On 6th September 1957 the Saltburn West Junction to Brotton line was closed to passengers but remains open for freight to this day. mineral traffic from Boulby Mine and steel from Skinningrove. Test train passing through Brotton Station looking north in February 2011. 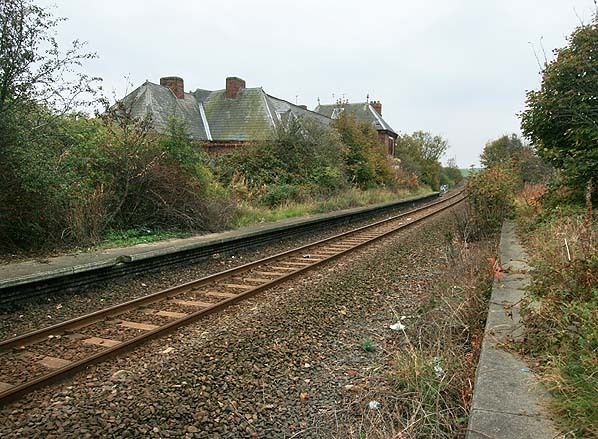 All the undergrowth has been cleared from the platforms since the picture above was taken in 2007.